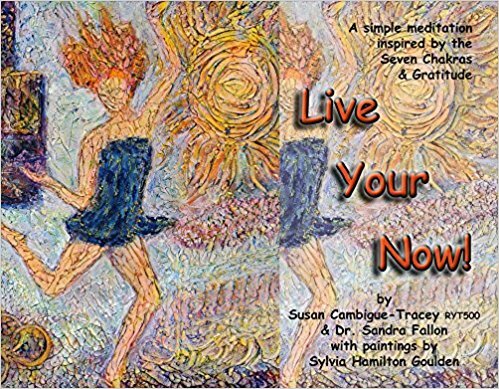 Filled with wonderfully crafted illustrations, “Live Your Now!” is a unique and wonderful guide to yoga and non-yoga students to further explain the concept of chakras. Yoga teacher Susan Cambigue-Tracey has an impressive list of achievements and credentials in the creative world. Besides teaching and practicing yoga, she’s a dancer, writer, and educator. Through her book, she plans to extend her knowledge about the importance of the energy that centers in the body. Other than that, she also incorporates the role of artistic expression as a way to help people see and feel things more powerfully. “Live Your Now!” helps readers transform negative thoughts into positive energy. She teams up with co-author Dr. Sandra Fallon, a cardiologist, and scientist, to make this book unique and powerful. Readers will find each section written from both viewpoints: yoga and science. Further explaining chakras and how cultivating positive energy, the book presents the authors’ insights in a clear, simple, and understandable way for readers to easily follow. As a way to reach out to more audiences, “Live Your Now!” joins in the upcoming 2018 Frankfurt International Book Fair. Happening on October 10-14, 2018, the world’s largest trade fair of books will showcase thousands of great titles all over the world and this book will definitely be a part of this wondrous affair. Become inspired by the power of positive energy and artistic expression by grabbing a copy! Susan Cambigue-Tracey has collected an impressive list of credits over 55 years as a dancer, arts education administrator, writer, nationally recognized dance artist and educator, creative thinker, and certified yoga instructor, RYT500. After retiring, she continues to work part-time at the Music Center of Los Angeles County as Director of Special Projects. For 25 years she has created artistic collage works and original jewelry. Her Jeweled Tree Empowerment Collection includes necklaces, bracelets, and earrings made from a variety of beads, metals, charms, and gems. Currently, she teaches Level 1/2 flow and chair yoga (grounded in Lakshmi Voelker Chair Yoga style) at Goorus Yoga studio in Pacific Palisades, California. In addition, she teaches classes and private sessions in yoga and Life Coaching in her own studio. She and her husband, international musician, songwriter and storyteller Paul Tracey, also host inspiring artistic salons several times a year in their garden and studio.